3. Add wet ingredients and use your (clean) hands to mix well and toss to coat – it’s sticky but that’s the way it should be. 4. 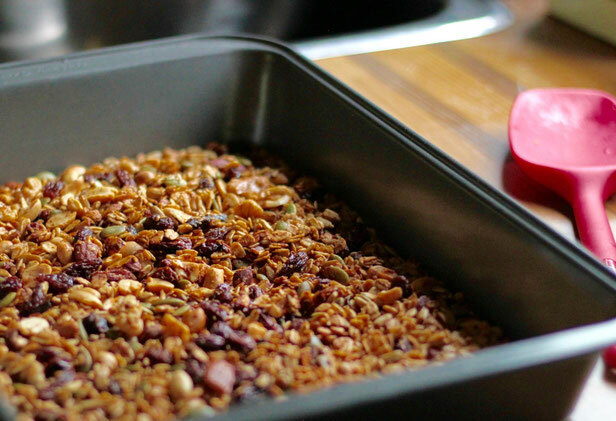 Spread mixture in thin layer on a parchment paper on a baking tray and bake for 10-15 minutes, until lightly toasted. Turn once during baking. 5. Cool before serving or storing. 6. Store in a mason jar or BPA-free plastic bag for on the way. 6. Enjoy your breakfast with yogurt and fruits, milk or vegetal milk.